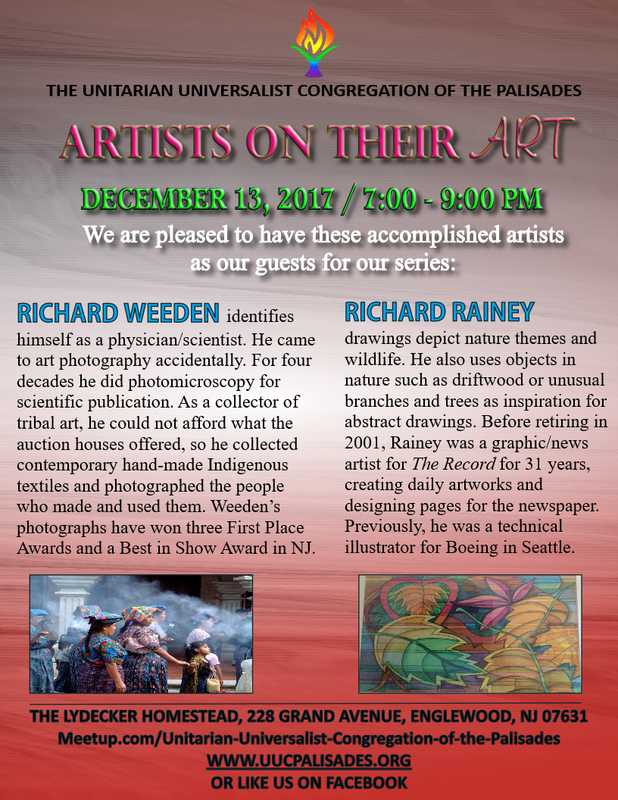 Please join UUCP on Wednesday, December 13th at 7:00 PM for our “Artists On Their Art” Series. 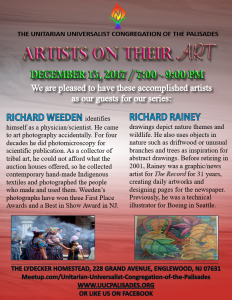 We are pleased to have two very accomplished artists for our series: Richard Weeden and Richard Rainey. Richard Weeden identifies himself as a physician/scientist. He came to art photography accidentally. For four decades he had his own darkroom and did photomicroscopy for scientific publication. As a collector of tribal art, Weeden could not afford what the auction houses offered, so he collected contemporary hand-made indigenous textiles and photographed the people who made and used them. Without his knowledge, his wife Robbie, entered some of his photographs in a photo contest in Bergenfield and won first prize. Thus began his career as an accidental photographer-artist. The photographs and textiles from Guatemala, Panama, Morocco, Greece, Laos, Cambodia and India capture the vitality of indigenous cultures around the world. Weeden uses both an unobtrusive (stealth) point-and-shoot, palm-sized Pentax digital and a large, highly visible, Olympus digital through-the-lens reflex camera. Most of his photographs were taken from 2001 to 2012. Now his life is constrained by Parkinson’s Disease. Weeden is an emeritus Professor of Medicine, and Professor of Preventive Medicine and Community Health at the University of Medicine and Dentistry of New Jersey – The New Jersey Medical School, Newark, NJ. He has exhibited photographs and contemporary indigenous textiles at the Weiner Library at Fairleigh Dickinson University, Teaneck, the Elmwood Park Library, the Waltuch Art Gallery at the JCC on the Palisades (2006), Tenafly, NJ, The Belsky Museum, Closter, NJ, The Georgia Sheron Gallery, Waterbury, CT, The College of New Jersey Art Gallery, and the Portfolio Restaurant, New York City. Weeden’s photographs have won three First Place Awards and a Best in Show Award in New Jersey. Richard Rainey’s drawings depict nature themes and wildlife. He also uses objects in nature such as driftwood or unusual branches and trees as inspiration for abstract drawings. Rainey credits his Paterson elementary school art teacher Ruth Corbett with fostering his artistic talent. A class field trip to the Metropolitan Museum of Art in New York City introduced him to the world of art. Rainey was a Fair Lawn High School graduate. He then attended the school of Visual Arts before serving in the U.S. Army as the 6th Army general’s staff artist. Rainey has continued to explore his fine arts interest and his own vision. Before retiring in 2001, Rainey was a graphic /news artist for The Record for 31 years, creating daily artworks and designing pages for the newspaper. Previously, he was a technical illustrator for Boeing in Seattle. Throughout all these years he continued his interest in Fine Art, attending life drawing sessions and experimenting with his own vision.